Most painters will agree that there's nothing like painting on canvas. But pre-stretched and primed canvases can be expensive, which means that all too often we keep our canvases for 'good' paintings. By stretching your own canvas, you can not only save money but get something you're willing to experiment on. You also get a canvas that's exactly the size you're after. 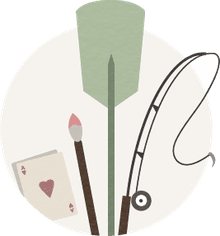 A length of canvas (unprimed or primed). Four stretchers (the wood that makes up the frame). If you have some DIY skills, you can make these yourself. Staple gun and staples (or carpet tacks and hammer). Canvas pliers aren't essential but do make it easier. The first step is to join the stretchers. Lay them out on the floor, then push the corners together by hand. If necessary, tap the corners gently on a carpet or with a rubber hammer (be careful not to dent the wood). Check that they're at right angles, either with a set square if you require mathematical precision or with something that has a fairly accurate right angle on it, such as a book. Roll out your canvas, put the frame on top of it, then cut it to size, remembering that the canvas has to fold over the outside edge of the stretchers. Rather be over-generous in the size you cut and trim off the excess when you've stretched your canvas. The most important thing to remember when attaching your canvas to the stretchers is to work from the middle outwards and in opposites. Starting in the center on any side, staple the canvas to the back of the stretcher. Put in about three staples, approximately two inches apart. With your first few canvases, you'll probably put in more staples than you need; practice will give you a feel for this. Move to the opposite side, pull the canvas taught, and staple the middle in place. Repeat with the other two edges. Staple one edge from the middle to the one side. Remember to pull the canvas as tight as you can. An extra pair of hands or a pair of canvas pliers is useful. Do the same on the edge that is diagonally opposite. Continue like this until all the edges are in place. If you're stretching a very large canvas, don't staple all the way to the corner in one go. You'll get better tension by doing it in sections. 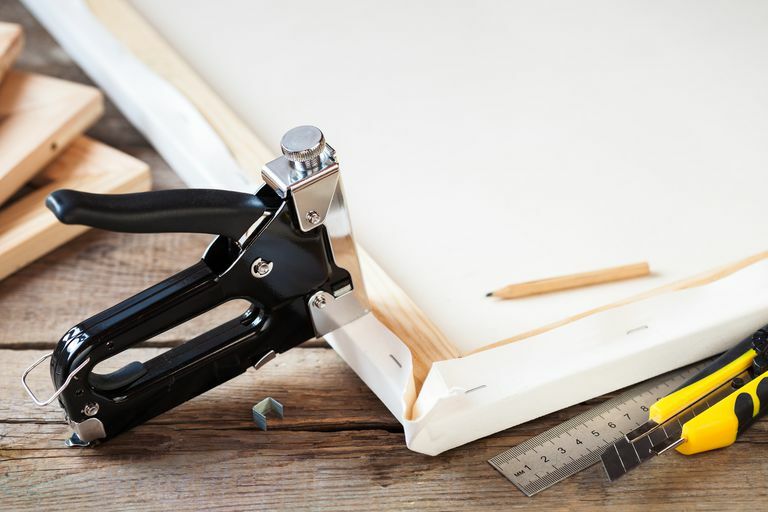 At the corners, fold the edges of the canvas neatly and staple the one on top of the other. If your canvas needs a little tightening, tap in the frame keys. But don't rely on these. If you find your tension isn't good, rather remove the staples and start again. Stretchers are usually sold in pairs, so by buying sets of different lengths, you can make a rectangular canvas rather than a square one. Get a strong friend to help you by holding the canvas in place while you staple it. If your local art store doesn't sell unprimed canvas by the yard, buy it from an online supplier. Alternately, ask your local fabric store if they've got heavy-duty, unbleached calico. Smooth any imperfections with a piece of fine sandpaper or nail file. You can make your own stretchers from 1"x2" wood, cutting miter corners which you join with corrugated nails.